So, what does AI mean for SEO? Currently, AI is utilized in digital marketing to collect data on ad targeting, to determine the relevancy of content, also it’s used to exam customer segmentation for cross-selling, for streamlining ads campaigns and evaluating which emotional values have the maximum effect on their targeted market. But the number is growing for organizations to use AI technology to enhance their search engine rankings. Once you search for something with the use of the AI/SEO technology, the result displayed will remember several things, such as search history, favorite websites, and what other customers clicked on for the same query. AI enhancements mean ranking factors can change from query to query, as the algorithm learns from how people are clicking on the search results and decides on the best-related factors to take into account for every search. Latent Semantic Indexing: what is it and how does it impact SEO? Latent Semantic Indexing poses a debate for some, but first let’s define exactly – what is Latent Semantic Indexing or LSI? LSI uses a mathematical technique called singular value decomposition to scan unstructured data within documents and identify synonyms and relationships between the concepts. Basically it finds hidden relationships between words so that search engines, such as Bing or Google can index the site. Examples of synonyms: pupil = student or purchase = buy. 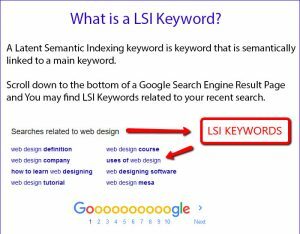 What is a LSI Keyword? With LSI machines are being trained to adapt to conversational phrases and language and LSI also allows documents to be clustered together based on their common themes. So, which is it? Be concerned with LSI keywords or simply be concerned with providing keyword synonyms (phrases and co-occurrence of words) that say the same thing and give Google and Bing something to sink their teeth into? I think the latter. In our final article, we’ll address more of the impact on SEO and AI assisted marketing tools. This article was previously written for a guest blog on Data Technology LLC.